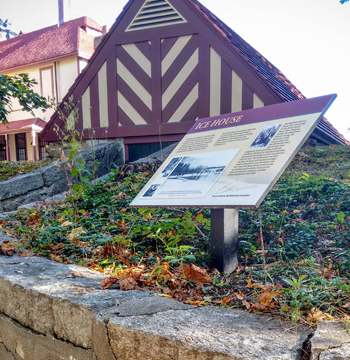 The Falmouth Historical Commission developed and maintains a list of Falmouth buildings, landscapes, monuments, and other resources of historic or architectural significance. The Commission maintains files at Town Hall in the Planning Department of information and documentation for each listed property and may add properties to the list by majority vote of the Commission. Listing usually means that the Commission has also recorded the property on the Massachusetts Historical Commission’s cultural inventory. The list of historic resources was first compiled with the intention of documenting 100 historically significant properties in the Town. Then, in 2008, the Falmouth Historical Commission applied for and received $30,000 from the CPFund to hire Larson Fisher Associates Inc. to survey and document a larger number of properties with architectural and historical significance lying within five distinct but under-represented areas of the Town: Belvidere Plains, Megansett, Manauhant, Tobey Lane, and the northern section of Woods Hole. The Historical Commission had also identified a number of individual properties outside of these areas, including two farmsteads, worthy of special attention as representative of other aspects of the community’s history. A total of 716 properties had been identified, 448 of which contributed to the historic character of their immediate neighborhood and the Town as a whole. Additionally, six areas and two individual properties were considered to be eligible for the National Register of Historic Places. The objective of the 2008 study were (1) to add historically significant buildings constructed between 1850 and 1930 to the Town’s Cultural Resources Inventory; (2) fill out the Inventory to include more resources in the five under-represented neighborhoods; (3) diversify the Inventory to better represent Falmouth’s farming heritage; (4) evaluate and document the significance of these properties; (5) create survey forms for areas and individual properties that met the current standards of the Massachusetts Historical Commission; and (6) provide the necessary documentation for nominations to the State and National Register of Historic Places. The project was completed in 2009 and files for all listed historic properties are available in the Planning Department at Town Hall. In 2017, the Historical Commission applied to the Community Preservation Committee again for an additional $30,000 to update the Town’s List of Significant Buildings and identify additional historical structures and spaces in Falmouth older than fifty years. The Historical Commission is committed to meeting the Town’s objective, as recorded in its 2014 Historic Preservation Plan, of documenting all of Falmouth’s historic resources. It will use the 2017 grant to determine which additional structures and spaces merit documentation and inclusion on (1) the Town’s List of Significant Buildings and (2) the Massachusetts Historical Commission (MHC) inventory of significant historic resources state-wide for preservation and funding purposes (See MACRIS, the MHC Cultural Resource Information System at mhc.macris.net.) The List of Significant Buildings includes historic resources both within and without the boundaries of the Town’s seven Historic Districts. Structures and spaces listed on the Town’s List of Significant Buildings will be protected from demolition without previous review under the Falmouth Demolition Delay Bylaw. Moreover, the Commission intends to consider the expanded list of Falmouth historic resources to determine the need for expansion and reconfiguration of the current Historic District boundaries.